Karnak is an ancient Egyptian temple complex located on the eastern bank of the Nile River, where the modern city of Luxor lies today. The earliest surviving evidence of royal construction at Karnak Temple is a column fragment from the reign of Wahankh Intef II (2112-2063 BCE). Karnak's grand temple construction began during the reign of Senusret I around 1971 BCE, and took fifteen hundred years to complete, with as many as thirty successive pharaohs adding to it. This complex could reasonably be called a city of temples. Its size covers an area of over one hundred hectares (247 acres) and is bigger than some ancient Egyptian cities. It is the largest temple construction in the world. The largest room is the Great Hypostyle Hall with a surface area of 54,000 square feet (5,107 square meters). This hall contains 134 gigantic columns. The temple complex was principally dedicated to Amun-Ra, with areas for his wife Mut, and Montu, the god of war. A small area of Karnak was also built in honor of the Aton (whom Pharaoh Akhnaton worshipped) however, following his reign, this part was destroyed. The name Karnak in ancient Egyptian means “the most select of places.” Karnak was a sacred place that was built for the deities. Ancient Egyptians came here to worship, pray, and celebrate. They believed that, just like humans, their deities needed to rest and recharge with positive energy after working so hard during each agricultural cycle. The Opet Festival took place at Karnak annually to celebrate and achieve this regeneration. During this festival, Amun-Ra's statue was anointed with holy water and ointments, decorated with exquisite jewelry, and dressed in fine linen. 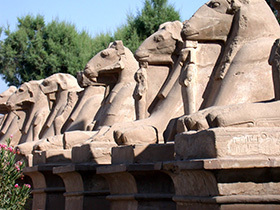 Image: Karnak, ram-headed Sphinxes. Taken by the Rosicrucian Egyptian Museum.